Neighbors greeted one another in line. Strangers commiserated over the weather. Volunteer poll workers scoured voter rolls and processed ballots. On Sixth Avenue in Brooklyn, a state judicial candidate stood smiling on a street corner in the early-morning drizzle, introducing himself over and over to voters who he knew would probably forget his name five minutes later. American democracy has had a rough go of it lately, but there was a lot to celebrate in Tuesday’s midterm elections. In the middle of one of the most culturally fractious and politically toxic periods in the nation’s history, tens of millions of Americans of all races, classes and creeds came together as political equals, to cast ballots and decide the future course of the country. The best part was that voters showed up — energized by outrage at the Trump presidency or by zeal for it. From Nevada to Texas, from Florida to Maine, turnout numbers blew past those of recent midterm elections, even with blustery and wet weather consuming most of the eastern United States. In places that offered early voting, 39 million voters cast ballots before Tuesday — nearly half again as many as did so in 2014. 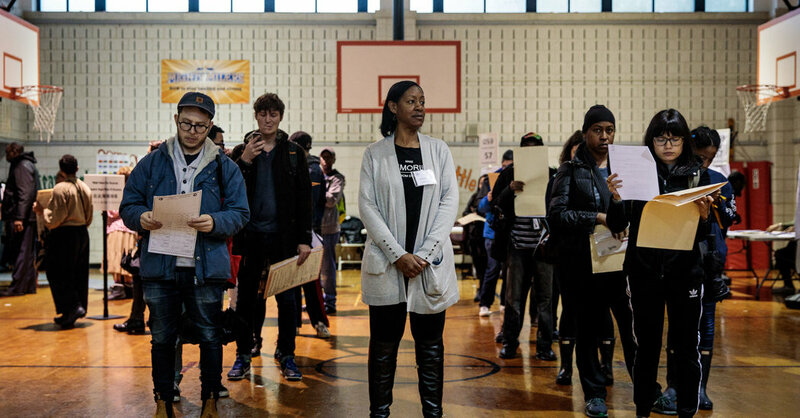 Young people — who have been notoriously bad at showing up to the polls — turned out in record numbers. These were encouraging signs of the health of American democracy. But one didn’t have to look far to find a good deal of sickness. Dozens of polling places in key areas opened late, including in Porter County, Ind., and Harris County, Tex., home to Houston. After an Indiana judge ordered the affected precincts there to extend voting hours to compensate for lost time, lawyers for the Republican Party fought back, asking that any ballots cast after the original 6 p.m. deadline be counted as provisional, potentially opening up thousands of ballots to challenge. Across New York City, voters waited for hours as electronic ballot scanners broke down, jammed by two-page, rain-soaked ballots. At the Brooklyn Public Library, every scanner malfunctioned, and voters began using the emergency ballot box. Brad Lander, a member of the City Council, described the scene at his precinct as a “mosh pit.” It was yet another display of staggering official incompetence and disrespect for voters in this supposedly progressive city. At an elementary school in Snellville, Ga., a Democratic suburb of Atlanta with a large minority population, hundreds of people waited more than four hours after voting machines stopped working. The culprit? Missing power cords. Many voters gave up and left. Georgia has no shortage of electoral problems, of course, including a secretary of state, Brian Kemp, who set the rules — and is counting the ballots — for the same governor’s race in which he ran as the Republican candidate. Mr. Kemp has repeatedly injected partisan politics into a job that should be nonpartisan. Last weekend he accused Democrats, without any evidence, of hacking into the state’s voting systems. He has also targeted minority voters in a race in which his Democratic opponent, Stacey Abrams, would be the nation’s first black female governor. He suspended the registrations of 53,000 Georgians, a vast majority African-American, for even minor typos. And he has pursued multiple voter-fraud investigations into turnout efforts aimed at minority communities. On Tuesday, the average wait time in parts of the state was three hours, and poll hours were extended at some locations. At least the state offered more than two weeks of early voting, which a record 2.1 million Georgians took advantage of. No such luck in New York, where Gov. Andrew Cuomo and state lawmakers have failed repeatedly to pass even the most obvious electoral reforms that are now sweeping the rest of the country. From early voting (adopted in 37 states) to automatic voter registration to same-day registration to no-excuse absentee ballots — there are plenty of proven ways to make voting easier if you really want to. Instead, New York’s lawmakers remain trapped in the last century, leaving their voters stuck and stewing in endless lines. Now legislators have an opportunity, at last, to show these long-suffering citizens some respect. Doing that in New York, and in the other electorally benighted parts of America, is vital to preserving democracy and the public trust it depends on to work.